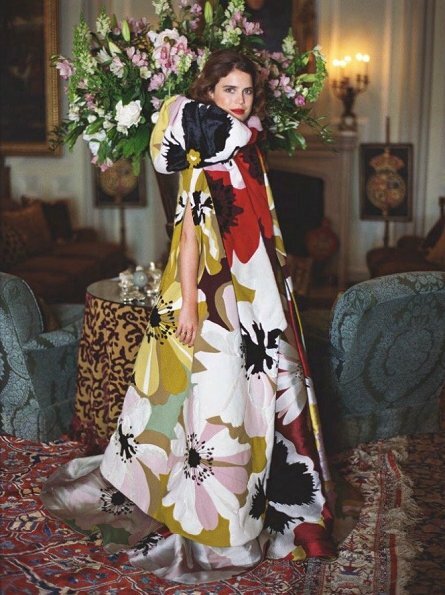 Princesses Beatrice and Eugenie gave an interview for September 2018 edition of British Vogue. Princess Beatrice and Princess Eugenie told the difficulties of social media in their first joint interview and also told that they become an object of mockery all the time and that they face criticism. They also confessed that it is very hard to live in the public eye and that they sometimes cry because of the critics. Lovely outfits. Can't wait for the September edition of Vogue and more photos of the two Princess's hopefully. Not to keen on the dresses or shoes,but their makeup is very nice.The dogs are cute. Wow, look at that, beautiful! Overwrought and overdone outfits, as usual. And the horridly heavy makeup does not help. The dogs are very cute. While not crazy about their shoes, I do like their dresses. Hair and makeup is beautiful!! At times, some of their styles have been a bit much, especially their hats at William and Catherine's wedding, not sure what was going on there. They had to have known that those hats were crazy and would not get a great review. That being said, it is good to remember all these ladies in royal life have feelings too. Constructive criticism can be helpful, personal, mean attacks are just not right. They both look very nice. Even though these girls are “privileged,” they have had a hard time in the public eye. I love seeing sisters who have a close relationship as these seem to have. Not a fashion statement but the caption introduced it. and just hold down a real job like most people . For someone's word to hurt you. first you have to respect that person's opinion. That's a great meme but i disagree. Maybe if you're only dealing with the occasional bit of criticism. However, if every time you look at a newspaper or magazine or on the Internet someone is criticising it must get to people. I think they are morphing into the Olsen twins. Weird clothes. They look gothic. Cute dogs, what breed are they I wonder? A type of Corgi maybe? I also thought of the Olsen twins, lol. Not something to aspire to. Karen AR: They could be the robust and funny Norfolk Terriers, maybe? Haha, it does seem a bit like that. It's nice that they stick with each other but I think their clothes and make-up are 'de trop' - too much - no wonder they are criticized. Neither of them has a good sense of fashion, but that's only my opinion, agree or disagree. hard to see a context, that they have been criticized throughout their adult lives. Eugenie has always been a beauty in wrong outfit, but both sisters look good in this outfits except from the hideous shoes, IMO. Of course these pictures are staged and artificial, but here this is on purpose. That's why I like it. The pictures are close to art. I don't know much about Beatrice but Eugenie is, as far as I know, working for a gallery. She studied history of art, did she not? So in this case the photos are suitable and have to do with her life and her job. I look forward to Eugenies wedding, I like her. Outfits are interesting, although the shoes are unkind. Eugenie looks very beautiful to me in this photograph. I can't be sure what the Vogue-team did differently to her usual appearance, but I see her in a new light. Beatrice too looks good, but her make-up, to me, is indeed too heavy, especially around her eyes, while the dark lipstick makes her lips look thin. Great picture - I like the Gothic vibe. I think they look good. I think some people (not necessarily referring to posters here!) are unfair - they have jobs and whilst some might not like their style they are never indecent or "inappropriate". They seem like decent human beings and certainly haven't created any headaches for the Royal Family. Just to add - I think they are fashionable. The trouble with trends is they don't always suit everyone and maybe if they went for classic rather than trendy they would cause less comment. Personally, I like people who have fun with fashion even if it doesn't always work. They're young - plenty of time to discover classic elegance (if they want to). Interesting point of view, I think something similar. But the two have often crossed the border to bad taste with their fashion experiments. 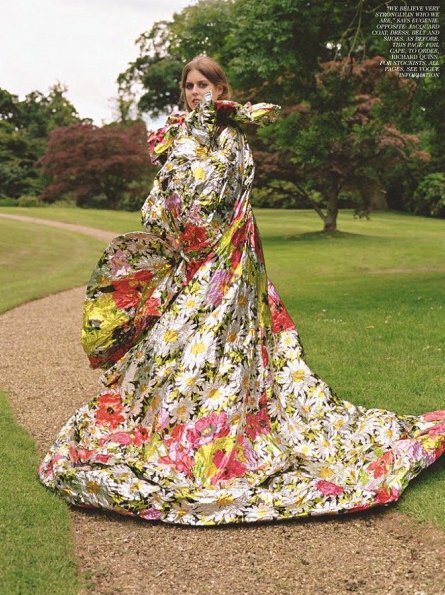 Eugenie in particular has more potential to make something of her type. Nevertheless I like the picture very much: country life with a twist ;). Sorry, ale straszne te buty i sukienki. Z którego stulecia?...Kto ich wysokości tak ubrał? Wyglądają jak "Ciotki Klotki Helenes". To są za mode dziewczyny aby je tak ubierać. Nie muszą mieć dobrego gustu ale wizażyści nie powinni tego wykorzystywać. Niech zaprzestaną je ośmieszać. One naiwnie pozują w dobrej wierze i zaufaniu - że to ładne. Attractive women - but they need a stylist. Once you get over the truly hideous shoes, the outfits are not so bad. I like Eugenie's dress and think it's actually one of the better Erdem designs we've seen on royalty this year. Both jackets are fine too. Wow! The posters here really are uptight about shoes. 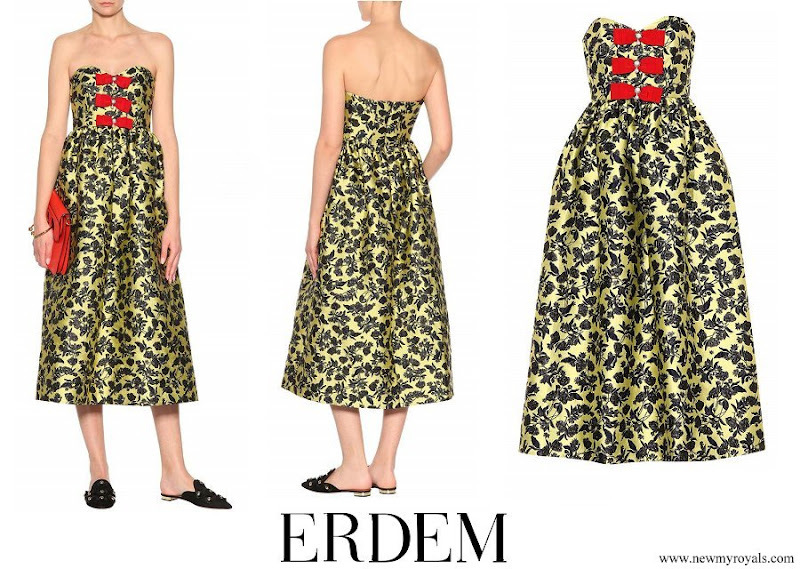 Shoes must have a boring mid-height heel with no embellishments or there is critism. God forbid the shoes have any style. These shoes are really cute (I understand not for everyone), and I love how the princesses are styled. And yes they were styled. I also have a great deal of respect for them because they try new fashion, and they do it knowing they will be criticized. It may not always work, but they try. It doesn't seem they do anything right for some people. Try to remember this is a fashion shoot for Vogue. Interesting and lovely pic. 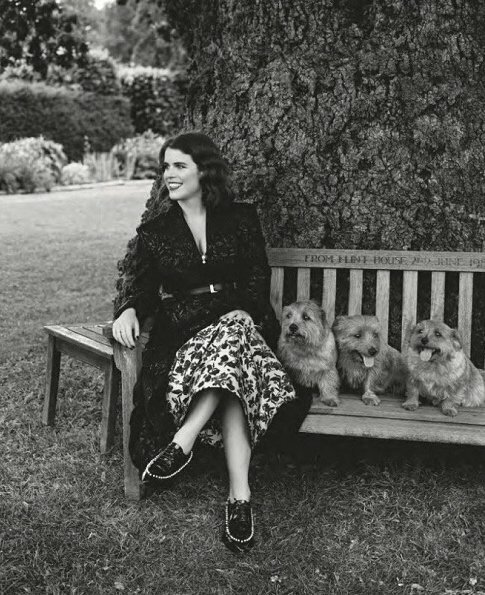 Beautiful Princess Eugenie seems to take after the Queen and Susan Barrantes and Princess Beatrice takes after her mother the Duchess and their father Major Ronald Ferguson. Absolutely disagree, i think Beatrice is the spitting image of her father and Eugenie starts more and more to look like her mother (jawline) but she also looks like the queen mother when she was young. They both should hire a stylist, at least to take care their outfits at public events. That would ease their lives so much when they do not have any eye for style themselves. Everybody else could have told them that toilet ring hat to William´s weddings would make people criticize. These pics are interesting. Again showing how much beauty they both loss with wrong clothes and make-up. They could both look gorgeous with all their money.